All these testimonials come from the hearts of the students at John R. Wooden High School. The farm helps me with my life in general. I have a really bad temper. Anything can snap me, but since I started this school and I spent time at the farm, I’ve learned patience. I learn to be… not wise, but at least more calm. Violence is not gonna solve anything, it’s just going to make things worse. The farm is important to me because I love being around animals and helping them. My favorite animal is Ralphie because he is really calm and always relaxing. I also like that he never bugs other animals on the farm. Having this farm at my school changed me a lot because now I actually do want to be in school and not be ditching like when I was in the other school. I want to help my farm and the animals as most I can. I’ve never worked on a farm or been around animals such as the ones on our farm. As I worked on the farm, I learned and it was therapeutic for me. Karen and Ms. Darling have made it fun and productive. I’ve been on the farm a few times where after work I just like to relax looking at the animals, feeling a bit peaceful. I hope to one day help out on a project like this somewhere else like Karen has helped us. Have you ever felt useless and insignificant? Well before I came to John R. Wooden High School that’s exactly how I felt. I was about to drop out of school. 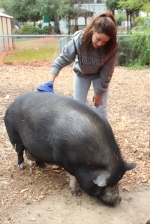 But then my friends told me about Wooden and how they enjoyed the school because they had a chance to work on the farm. When I heard that, it got me interested in working at the farm. It made me actually want to come to school from then on. Helping on the farm you see that all of the animals have their own personalities. They don’t talk but just little things they do make them unique and playful. I really enjoy just feeding the animals- it feels good because it’s like I know that they need me. The animals would not be able to survive without our care. I spend a lot of time on the farm and I no longer feel useless. For once in my life I feel like I’m doing something productive for me and my community. The farm teaches me many different things like how to trust one another, how to take on responsibilities and new skills. For many kids in my school, the farm has given us something to look forward to. The garden has also taught us things like how to save water and make a change in the environment. We learned how to plant seeds and grow them in healthy soil. It has inspired me to start eating healthier and grow my own fruits and vegetables. The neighborhood kids love to pass by just to see the beautiful garden that we have grown and all the animals. It makes us feel good to know that we all work together as a small family to make it look good. I like helping and knowing I can make a difference. The farm at JRWHS has made a difference to me because somehow it made me feel like I belonged here. I kept moving schools a lot because I didn’t feel needed. It brought me down and made me feel useless. When I came here, I saw so many smiling faces and I was curious why they were so happy to come to school. I later found out that the reason everybody was so happy was because of the farm. Who would ever think a goat would make me a better parent? The farm has made a really big difference in my life because it made me become more responsible, caring and a better person. I used to hate going to school, so I would always ditch, but since I started coming here I’m actually excited about coming to school every day. I think the farm animals made me a better person because I used to drink, smoke, pop pills and I was very rebellious, but ever since I started to care for the animals it’s like I started to lose interest in the bad life and I actually started doing good. Before I came to this school, I didn’t like working with other people, but the garden taught me how to be part of a team. Whenever I feel depressed, moody or mad I just go to the garden and work with the plants – it helps me relax. It gives me inspiration just to see the plants grow. It’s amazing how a little piece of land has become our farm and our garden and how it has changed my life. Working on the farm everyday has changed my views on animals and eating healthy. The farm is my second home, and I have a strong pride for all the hard work I put into the farm. When I feel down, I go out there and look at the farm and it makes me feel better. The farm has taught me how important treating our animals and our environment is. I learned about compost and how to grow fruits and vegetables. When I am on the farm I feel comfortable. I have a strong connection with the animals on the farm because I am on the farm every day helping out. On the farm I learn about teamwork and responsibility. I worked with my classmates to build the bunny pen, and when it was done, I felt proud of myself.